 Publiée en 1887 aux Etats-Unis, cette suite ne porte pas de nom d'auteur autre que celui de Dumas, mais elle est attribuée à Jacob Abarbanell. Elle s'inscrit dans la tradition des nombreuses suites données au Comte de Monte-Cristo à cette époque. 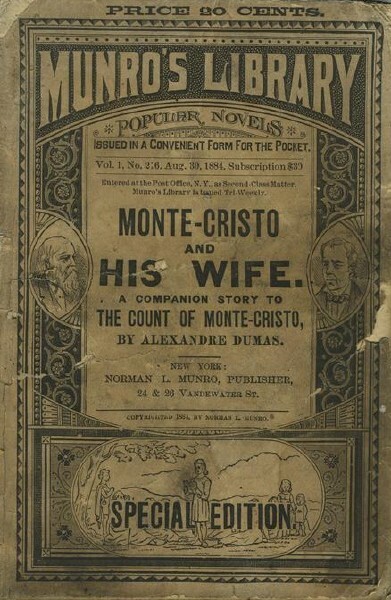 L'édition Donohue en notre possession mentionne parmi les autres livres disponibles chez l'éditeur les titres suivants: Bride of Monte Cristo, Countess of Monte Cristo, Daughter of Monte Cristo et Son of Monte Cristo. Thème général: Monte-Cristo a épousé Haydée, qui a retrouvé le "trône" de son père à Janina, en Grèce, où le couple règne désormais. A Paris, la baron Danglars, sa femme (qui tient une maison de jeu huppée) et Benedetto s'associent pour se venger de Monte-Cristo, non pas en le frappant directement, mais en s'en prenant à ses amis et protégés. Benedetto se charge de Maximilien Morrell, Danglars d'Albert de Morcerf et la baronne de Mercédès. Benedetto enlève donc Maximilien, le conduit à l'île de Monte-Cristo en espérant s'y emparer du trésor du comte et l'y mure vivant dans le repère souterrain. Danglars se fait nommer officier du régiment où Albert sert en Algérie. Le provoquant outrageusement, il se fait frapper par lui. Albert est donc condamné à être fusillé pour insubordination. Et la baronne annonce à Mercédès que son fils a été exécuté, pour la pousser au suicide. On s'en doute, les choses ne se passeront pas ainsi. Maximilien est sauvé par Franz d'Epinay qui passait par là, Albert par une attaque menée par Abdel-Kader, et Mercédès par l'arrivée de son fils! Pourchassés par le comte, Danglars et Benedetto assassinent leur épouse et mère pour la dépouiller (une scène mémorable qui se termine par un grandiose "Toi aussi, mon mari!" quand la baronne se fait poignarder par le baron - voir ci-dessous). Ils finissent exécutés sur l'île de Monte-Cristo. Assez bien mené et comportant quelques trouvailles comme le rétablissement d'Haydée dans les droits de son père, le récit est loin d'être parfait. Il ne se refuse, en particulier, aucune invraisemblance, aussi monstrueuse soit-elle. 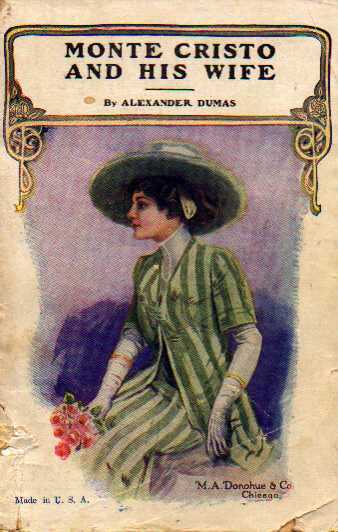 Des exemples parmi d'autres: Eugénie Danglars, la fille du baron, se fait engager comme soldat dans la troupe d'Albert de Morcerf, dont elle est amoureuse, et qu'elle épousera à la fin; il suffit qu'une courtisane travaillant dans la maison de la baronne Danglars se trouve en présence de Monte-Cristo pour qu'en une minute et demi, elle décide d'entrer dans les ordres (!). Surtout, comme souvent dans les suites "industrielles", les personnages sont caricaturaux. La plupart sont de pâles copies de leurs modèles dans le roman de Dumas - à l'exception peut-être des trois "méchants", assez bien rendus. Quant au comte, l'auteur anonyme n'a retenu du héros de Dumas que les caractéristiques les plus superficielles: la richesse avant tout, la prestance... Mais il ne reste rien de cette volonté implacable et de cette capacité à maîtriser les événements qui le caractérisent. Ici, Monte-Cristo ne fait que courir derrière ses ennemis, et si ses amis sont sauvés, c'est pour l'essentiel sans qu'il y soit pour grand chose. As a result of this conversation, on the night to which we have drawn the reader'sattention, Benedetto and the baron were sitting in Madame Herminie's bedroom, with their thoughts concentrated more on the millions in the iron safe than on the account she was giving them of her trip to Marseilles. "She is dead, dead," she concluded. "I saw her light the charcoal furnace and inhale the poisonous gases until she fell a corpse on the floor. Then I came away. Our mission is completed." 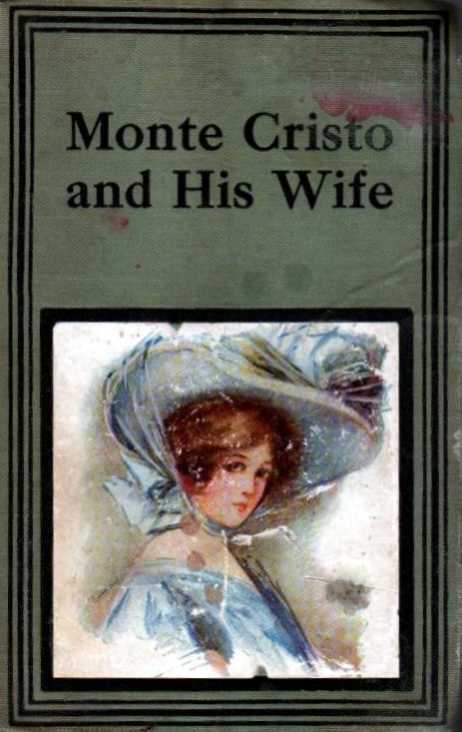 "Not entirely, my dear mother," said Benedetto; you forget that the Count of Monte-Cristo lives." "What of it? We were not to pit our strength against him. We have wrung his heart as it is. It would be folly to waste any money in attempting to overcome him." "How calculating you have become, my dear," said her husband. "As long as you had your own private grudge to satisfy against Mercedes you were willing enough to become a partner in our little game and supply us with the necessary capital. Now that you have accomplished your purpose you draw back. You think, that being a woman, the count will not wreak his vengeance on you. Perhaps you are right. He will hold me responsible not only for my acts but also for yours, since you are my wife. Benedetto and I must guard ourselves against him, and for that purpose we need more money." "Yes," chimed in Benedetto, "we need more money, and lots of it, too." Madame Herminie gazed at the two men before her, and then the truth flashed through her brain. They were there to murder and rob her. She grew deathly pale as she remembered that she had locked the door, and that it and the walls of the room had been purposely built so thick that however much she might scream and call for help, not a sound could be heard without. Together with the fear for her life was also the desire, strong within her, to retain possession of her money. Her husband had judged her rightly when he said that she was very covetous. She rose to her feet. The two men rose at the same time. 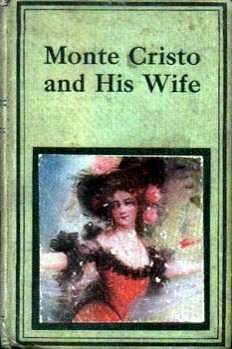 "This talk about the Count of Monte-Cristo is a mere pretense, she said, pressing her hand to her breast and seeking to conceal her terror. "You want the money for yourselves. Tell me how much, and if it is a reasonable amount, I will give it to you. "It will be simpler, mother mine," said Benedetto, coolly, "for you to hand us the key of your safe. We will help ourselves." "Yes, we will help ourselves," echoed the baron. "Then you propose to rob me," she desperately said. "Nonsense, mother," retorted Benedetto, with a horrible laugh. "Is not the baron your husband? Is he not, under the laws of France, entitled to his wife's earnings! Am I not your son and heir? We are not robbing you. He is simply taking what belongs to him, I am merely drawing an advance on my inheritance. So hand over the key, mother dear, and say no more". "Help! murder! Help!" she cried, making a sudden dash for the door, and frantically endeavoring to turn the key in the lock. Benedetto caught her by her hair and pulled her back into the center of the room. "Oh, no," he said, "you can't come that game over us. Baron, just see if you can find the key on her." "Mercy, husband, son!" gasped the unhappy woman. Benedetto threw her down on the floor and pinioned her bands and feet, while the baron searched her and found the key in her bosom. "I have the key," he said. He was very pale, and his teeth chattered a little as he spoke. He did not very much fancy this kind of work, but he, also, was afraid of the inhuman monster Madame Herminie had given birth to. "Very good. Open the safe and take out the money." The baron obeyed, and soon the floor was heaped up with bags of gold and piles of bank-notes. "We have the money," said the baron, "you may let her go now." "Oh let me live, Benedetto; let your mother live," pleaded the poor woman struggling to release herself. "For you to denounce us," retorted the assassin, as he knelt over the prostrate form with one knee on her heart, and clutching her throat with his left hand. "I'm not such a fool as that. What would you care for us, that we are your husband and son? You would send us to the guillotine at the first opportunity." "Mercy, Benedetto, mercy!" she gasped. "Here's all the mercy you deserve." He plunged his stiletto - that stiletto which was encrimsoned with the life-blood of so many victims - deep into her breast. A stream of blood spurted from the ghastly wound. "Inhuman offspring!" gurgled Madame Herminie. "Here - complete the job," exclaimed the assassin, throwing the reeking weapon to the baron. "I - I cannot," cried the latter, horrified, covering his face with his hands. "You must," hissed Benedetto, drawing his pistol and cocking it. "You must share the crime with me or I will blow your brains out. " He leveled his weapon at the baron's head. The latter, pale as death, and trembling in every limb, stooped and picked up the bloody stiletto. "Do you want me to kill you?" inquired the Corsican, as the other still hesitated. The baron tottered rather than walked to where his dying wife lay, and stooping over her, closed his eyes, as he thrust the weapon in her heart. "You too - husband? " gasped Madame Herminie. The next moment she was a corpse.